This set of seven stones is designed to keep you focused on what your body and mind need each day. Hindus and Buddhists believe our bodies contain seven chakras—crown to root—and that if these "energy centers" all align, we're feeling pretty fantastic. 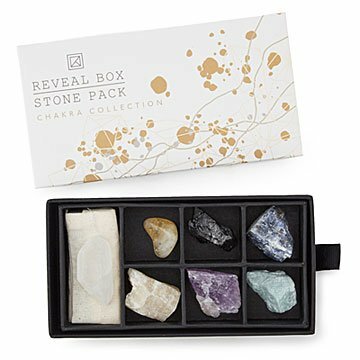 This set of seven stones is designed to keep you focused on what your body and mind need each day. Each is selected to align with a specific chakra, like amethyst for transformation and citrine for self-expression. Hold one during meditation to help you focus, or keep them all on display where you want the positive vibes to flow. Made in Brazil. If necessary, wipe clean with a dry cloth. Do not attempt to clean with chemicals or water.